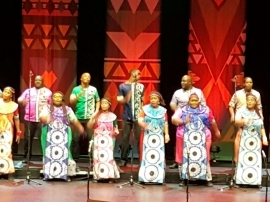 On Monday the 12th of December 2016, the world famous Soweto Gospel Choir took the stage to perform in the DeLaMar theater in Amsterdam. SANEC used this unique occasion to organise our end of the year event with an informal gathering that provided our members with the opportunity to get a grasp of the authentic South African culture. The spectacular show was filled with joy, soul, music, and dance. Before and in between the show, our members enjoyed drinks and bites in the SANEC Foyer while (re)acquainting themselves with others. Among the special treats were South African Boschendal wines and biltong according to traditional South African recipe. Sandra Velsma and Gijs van der Lugt, owners of Foodsie, for providing us with traditional South African biltong. SANEC is pleased to have ended the year with this exceptional event. We wish our members a fruitful and happy 2017 and we hope to welcome you soon at one of our future events! For a photographic impression, please click here. Don't forget to give our Facebook page a like. Get inspired by more magical performances and unique South African Wines and Biltong, by clicking below.